We had some pretty bad storms come though around sixish. 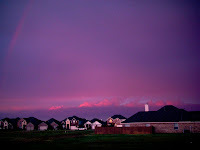 After they passed, we were left with a really pretty purplish and pinkish sky. You can also barely make out a rainbow on the left side. This is the view from our backyard.